We have just taken delivery of our third electric vehicle, with the aim of transforming 20-25 per cent of our light van and car fleet to ultra-low emission vehicles. The new electric van has been paid for by Go Ultra Low funding, an initiative made possible through investment from the government and automotive industry. South Gloucestershire Council along with other West of England authorities, Bath and North East Somerset, Bristol and North Somerset, are keen to set an example to businesses and other authorities across the UK by creating one of the largest electric vehicle fleets in the country by 2020. As part of this commitment, we have been awarded ‘Go Ultra Low Company’ status, in recognition of how we have already opened our vehicle fleets to plug-in cars and vans and made a pledge to boost our uptake over the next five years. The electric van is being used by our road safety officers for their day-to-day work travelling around South Gloucestershire. The road safety team will mainly be visiting schools using the van, transporting bikes and traffic cones for children to use during Bikeability training. As well as the new van, we currently have two electric pool cars, which are available to all staff to use for work purposes. Since they were introduced in January 2015, these have already helped us make significant savings on operating costs, as well as causing less air pollution than petrol or diesel fuelled vehicles. So far, the total fuel and maintenance costs for the electric vehicles we already operate amount to just under a third of those for the diesel engine vehicles (£1148.10 compared to £3635.65). Two more electric pool cars are being delivered at the end of the year. South Gloucestershire Council’s Planning, Transport & Strategic Environment lead member Cllr Colin Hunt said: “We are committed to making as many journeys as we can in a sustainable way. This new van combined with our existing electric cars will help us make substantial savings as well as helping create less air pollution too. 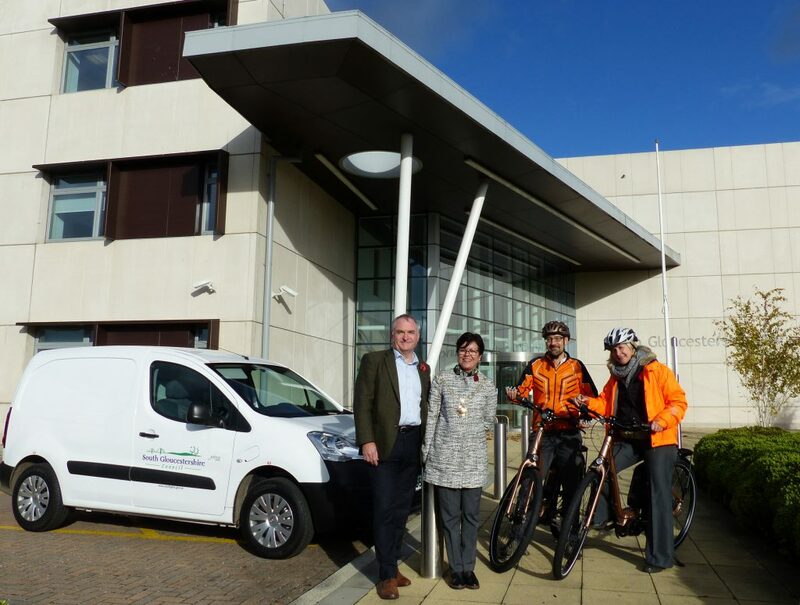 We are also encouraging more staff to cycle between our office locations in Yate rather than using cars. Two electric bicycles have been added to our fleet of pool bikes to further help us reduce car use during the working day. Standard bicycles have been available for staff to borrow to cycle between office locations for a number of years and it is hoped the introduction of electric bikes will help make cycling more accessible to a greater number of staff. The new electric bicycles have been match funded through the Sustainable Transport Transition Fund. To encourage more staff to consider riding a bike instead of taking the car we are also providing the opportunity to receive cycle training.